Mark Nelson, one of the eight crew members locked in Biosphere 2 during its first closure experiment, offers a compelling insider’s view of the dramatic story behind the mini-world. In his forthcoming book Pushing Our Limits: Insights from Biosphere 2, Nelson clears up common misconceptions as he presents the goals and results of the experiment and the project’s implications for today’s global environmental challenges. On a winter night in January 1993, by opening a doorway we experienced a stunning physiological revival. We left a world with an oxygen level around 14 percent; equivalent to being on a 15,000-foot-tall mountain. In fact, we were at a 3,900-foot elevation in southern Arizona. Oxygen had been slowly disappearing for sixteen months. No one knew where it had gone. We were slowly climbing a mountain but going nowhere. Mission Control had pumped oxygen into a chamber on the other side of the door. Our atmosphere suddenly contained 26 percent, which was 5 percent higher than Earth’s air. In minutes, we felt decades younger. For the first time in many months, I heard the sound of running feet. So many strange, disturbing, marvelous, powerful, and profound experiences unfolded during our two years as “biospherians.” The eight of us felt extraordinarily lucky to be the initial crew to live inside a miniature biosphere. We had to learn how to be its first natives. Biosphere 1 (B1) is our Earth’s biosphere. Biosphere 2 was a three-acre world. B1 houses the global ecosystem, which includes all life. B1 is our planet’s life support system. 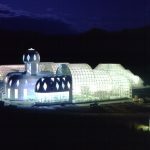 Biosphere 2 was built to study how biospheres work, creating a laboratory for global ecological processes, to help ecology become an experimental science. It could also provide baseline information to design long-term life support systems for space. The facility included people, farming, and technology. Earth’s biosphere has supported life for four billion years. Only quite recently have billions of people and modern industries been added. Living in Biosphere 2 might give new perspectives on whether—and how—harmony can be forged between humans and the global biosphere. Our two-year experiment began on September 26, 1991. We’d have two seasonal cycles to study how Biosphere 2 functioned. For comparison, a human spaceflight to explore Mars would also take two years. No one knew if we could stay inside for two years; so many things could go wrong. The facility was optimistically designed for a one-hundred-year operation. 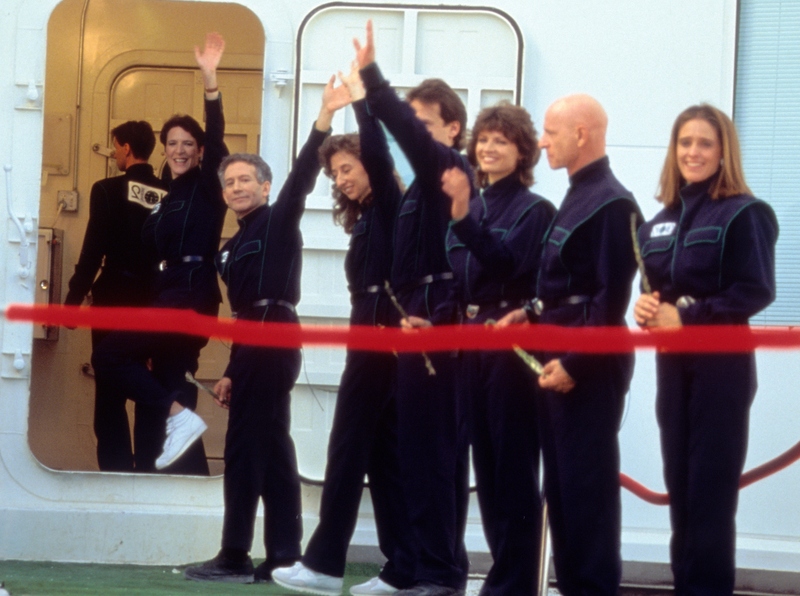 The biospherian crew on closure day entering the front airlock, September 1991. The first closure experiment was the “shake-down” mission; a trial run to find flaws, bugs, what we had to correct or change. We were also determined to collect as much data and to do as much research in collaboration with outside scientists as possible. The odds, even from project insiders, heavily favored an early exit. Too many challenges—known and unknown—could end the experiment early. Some thought we wouldn’t even last three months. The world record in a closed ecological system was six months set by two-person crews at a Siberian research institute. Their basement facility powered by artificial lights was the size of a small apartment, their only companions were food crops. Our own sunshiny world contained a rainforest and a coral reef in a towering structure with seventy-five-foot-tall roofs. Every day we were able to stay alive inside, we would amass reams of research data. We entered an untested facility in almost totally uncharted territory. We included small chunks of Earth’s diversity inside the biosphere; bonsai rainforest, tropical grassland (savanna), desert, mangrove marsh, and coral reef ocean co-existed under one roof. Some of the world’s top ecologists and most innovative engineers worked to make this possible; no one knew how these biomes would develop. Ours was cutting-edge science, the greatest experiment in ecological self-organization ever conducted. To maintain biodiversity, we biospherians would intervene when we could. Our fog desert decided to go its own way and transformed during the experiment; maintaining the others took hard work and ingenuity, the coral reef in particular, was a nail-biter to the end. In our nearly airtight world, we would experience the highs and lows of living intimately with seven other people. Outside politics and power struggles polarized and exacerbated in-fighting, though we entered as the best of friends and colleagues. I wouldn’t permit a bitter “To the traitors” as toastmaster at a Sunday night dinner where we enjoyed a precious bottle of home-brewed banana wine. There were no fistfights, but one crew member complained years later that she had been spit at. Twice. But we continued working unselfishly with one another. Whenever we feasted, partied, or enjoyed a rare delicacy like a cup of coffee from rainforest trees, tensions magically melted away. We’d relax and enjoy a temporary truce from group tensions. We acted mindfully in Biosphere 2, understanding that its teeming life was keeping us alive and healthy. We took care of her needs with tender loving care. She was our third lung and lifeboat. Some of us thought Biosphere 2 was the ninth biospherian. Fish-eye lens photo of the Biosphere 2 farm. Photo by Abigail Alling, Biosphere 2, 1991-1993. Eight Americans and Europeans suddenly became subsistence farmers. We lived off the land, eating what we grew, though we farmed in a high-tech, $150 million facility. Our small farm exceeded organic standards. We used nothing that might pollute our air, water, soils, or crops. We recycled our water and soil nutrients. Even our sewage was treated and recycled. We cared for our farm animals with affection, but they were slaughtered as needed. Our diet consisted primarily of fruits, grains, and vegetables. We experienced hunger throughout the two years and plates were always licked clean. Almost all of us became much better cooks. Peer pressure for delicious food was a great motivator. I and many others ate our roasted peanuts whole, shell and all; we would eat anything to fill the stomach void. We were guinea pigs, the first humans extensively studied on an “undernourished but not malnourished” diet. This paralleled the pioneering research of Biosphere 2’s in-house doctor, who claimed a person could live 120 years on a calorie-restricted diet. Periodically, project managers reminded us we were volunteers; the airlocks were unlocked, and we could leave anytime we’d had enough or if there were health dangers. For safety, we had our resident doctor and a team of specialists on call at the nearby University of Arizona College of Medicine, and a fully equipped medical facility and analytic laboratory were inside the biosphere. Automated systems could detect potentially toxic substances in our air and water. We started with a biosphere as clean and unpolluted as possible. Chemical deodorants and cleaning supplies weren’t allowed because our world was so ensitive to pollution. Even a small fire would mean evacuating, so we didn’t light candles, even on a birthday cake. At winter parties, a monitor played a video of a wood-burning fireplace—we felt warmer sitting near it. Though we didn’t intend it, the toes of dominant analytic, small-scale science were seriously stepped on. The reductionist approach seeks to analyze everything at the micro level, each variable being tested separately. 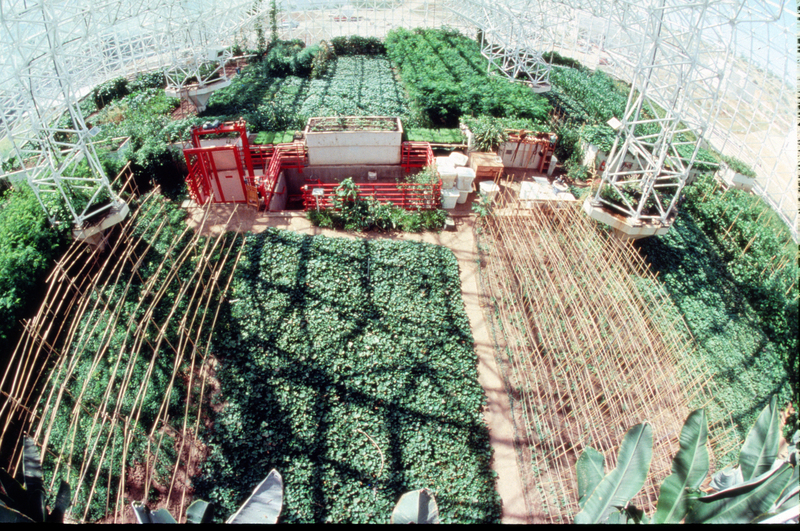 Biosphere 2 used both analytic and holistic science approaches. The project violated unspoken taboos. Include humans and our technologies in the experiment? Heresy! We knew one thing for certain: Biosphere 2 would ignite plenty of controversy. Systems ecologists and veterans of NASA’s Apollo Project 1960s glory days were allies from the beginning. To achieve the goal of putting a man on the moon by the end of the 1960s, NASA abandoned component-by- component testing and went to “all-up systems testing.” We followed a similar strategy to create this complex miniworld; it couldn’t be done piece by piece like Lego. The six years from project conception until completion were exciting. Scientists, engineers, and hundreds of construction workers were very motivated. They were making history, doing the near impossible. Some doubted at every stage whether Biosphere 2 could be built, operated, or used for advancing human knowledge. Who were these mavericks behind the project? Despite many world-class scientists and institutions consulting, the whole endeavor was way too ambitious, too daring. Even some friends and colleagues of the project thought it was fifty years ahead of its time. Biosphere 2 was radical and revolutionary—a challenge to “business as usual.” The entire “technosphere” had one overarching goal: serve and protect life. Our engineers had to design technology to make waves, rain, winds; they had to control climate and mimic geological processes. And they had to use machinery and equipment that wouldn’t poison and pollute. Life ruled. Technology knew its place and obeyed and served, a radical notion. What would happen if we did that everywhere? The engineering goal was about 1 percent per month air exchange (leakage) from the biosphere. That’s thousands of times tighter than the most tightly sealed buildings and homes, far tighter than even the International Space Station. But, if this air-tightness was achieved we might wind up with a horrific “sick building syndrome” from a buildup of trace gases. We needed a way to ensure that those trace gases didn’t build up in a structure with two acres of farm and wilderness areas, hundreds of pumps, motors, and other equipment, and miles of piping. Our solution was to use our farm soil and plants as a biofilter to clean the air. We hoped it would work. Carbon dioxide was called the tiger of Biosphere 2. We continually monitored its levels in our atmosphere since it could destroy our world, and it would be difficult to keep the levels from rising too high. Every cycle goes hundreds to thousands of times faster than normal in a tightly sealed, small, and life-packed miniature biosphere. Our ocean and atmosphere were tiny compared to Earth’s; we had entered a time machine. Would all the life inside Biosphere 2—with us humans doing everything we could to help—be sufficient to prevent a runaway rise in carbon dioxide, our tiny version of climate change? If CO2 levels got too high, our coral reef might die, all the plants (including our food crops) might slow their growth, and our health might be directly threatened. By closing the airlock behind us and starting our two-year experiment, we pushed the limits and stepped into the unknown. It would be a roller coaster, with despair and sadness and euphoria and achievement. Every day, we worked to keep Biosphere 2—and ourselves—alive and healthy. For the eight of us, it was a profoundly personal and life-changing journey. The author carrying fodder, sorghum stems after a grain harvest. Photo by Abigail Alling, Biosphere 2, 1991-1993. Dr. Mark Nelson was a member of the eight-person “biospherian” crew for the first two-year closure experiment. He is a founding director and the chairman of the Institute of Ecotechnics and has worked for decades in closed ecological system research, ecological engineering, the restoration of damaged ecosystems, desert agriculture and orchardry, and wastewater recycling. 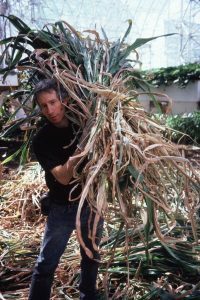 He is the author of The Wastewater Gardener: Preserving the Planet One Flush at a Time and co-author of Space Biospheres and Life Under Glass: The Inside Story of Biosphere 2.